Hello my foodie fans! I hope you all had wonderful weekend! Can you believe we are 30 days away from fall? While watching the food network season 8 I was so thrilled to discover Martie Duncan. Martie Duncan is from Birmingham, AL and by living in Birmingham I thought it was super cool to have an Alabamian to cheer for. I immediately became a fan after looking at her website Martie Knows Parties. I am so honored to have her as my foodie of the month. 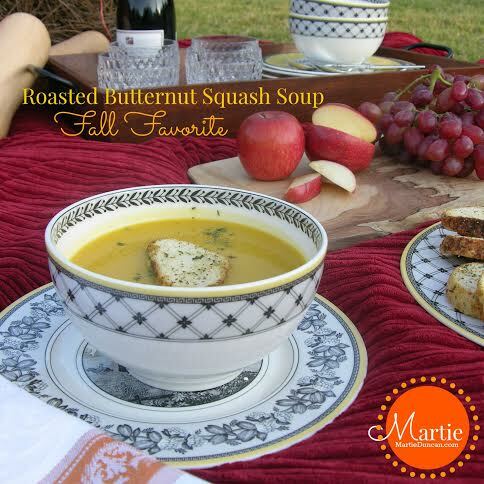 Fall is around the corner and she is sharing a yummy Butternut Squash soup with us. 1. How long have you been cooking? I’ve been cooking my whole life- alongside my mom as a child and then later in life, I started cooking for parties I threw for friends and family. 2. Why do you enjoy cooking? I love feeding people- it makes them happy. 3. Who taught you how to cook? My mother was the best cook I have ever known. I learned most of what I know about cooking from her. 4. What is your favorite thing to make or a great cooking tip? Favorite thing to cook? Pies. And ice cream. My mom made a pie or cobbler almost every single day. I love to use fresh from the farm ingredients like the blueberries my dad grows or peaches from Chilton County and turn them into summer’s most delicious desserts. 5. Do you have a favorite famous cook/foodie? I would say my favorite famous chef is Jacques Pepin. I’ve had the great pleasure of spending time with him. I loved hearing his stories about his time with Julia, his lifelong love affair with food, and was totally romanced and inspired by him to explore French cuisine. I how have quite a few French classics in my repertoire of recipes. Bobby Flay is another favorite. I worked with Bobby on Food Network Star and admire his work ethic, dedication to his craft, and how far he’s taken his star…. All the way to the Hollywood Walk of Fame. Rachael Ray is also another inspiration. Look at what she’s accomplished to make cooking at home easy and accessible for the masses. Terms like EVOO are now mainstream because of her. She’s self and family trained and has never been to culinary school but has never let that deter her from building an empire that is one of America’s favorite food brands. Peel the butternut squash. Remove the seeds. Dice into large pieces. Drizzle the squash with 1 tablespoons olive oil and sprinkle with a little salt and pepper. Place on a sheet pan or roasting pan. Bake for 20 minutes or until the squash is fork tender. Check the squash after 12 minutes and turn with a spatula. While the squash is roasting, heat remaining tablespoon of olive oil in a large pot. Over medium-high heat, cook the onion until softened but not browned. Add the cooked squash to the onion. Use a spoon or a spatula to break up the squash. Stir in the first 4 cups of chicken broth a little at a time. Simmer on low heat for about 20 minutes, adding more chicken broth as necessary to keep the soup from becoming too thick. Add the maple syrup, salt and both peppers. Whisk in the cream. If you like your soup with some texture, stop here. I like this soup really smooth so I use an immersion blender to make it smooth and velvety before I add the heavy cream. Just before serving, stir in a tablespoon or two of butter. I find it makes the soup even more velvety and delicious. I spoon this into quart-sized Mason jars, keeps in the fridge for 4 or 5 days. Sometimes I make a big batch and deliver it to friends around the holidays. Always appreciated.